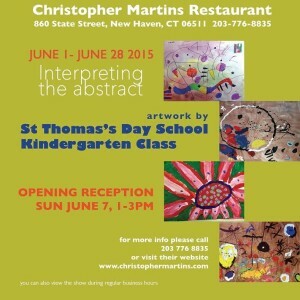 There will be a Kindergarten Art Opening Reception at Christopher Martins Restaurant, 860 State Street, New Haven, on Sunday, June 7 from 1:00 to 3:00 p.m. The children in Kindergarten will present “Interpreting the Abstract” artwork under the direction of Art Teacher Jan Nichols. Their artwork will be on display from June 1-28.